Murray Shire Council War Memorial was erected in memory of those from the shire who died in service or were killed in action during World War Two. 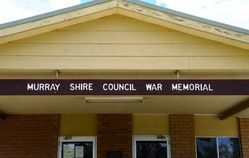 Councillors Dolan and Lea were appointed yesterday to represent the Murray Shire Council at a public meeting at Mathoura on June 23 at which the building of a suitable memorial for those from the shire who paid the supreme sacrifice in the 1939 - 45 war will be discussed. The meeting has been called to decide the most suitable memorial to build and to form a committee to raise finance for the work. The memorial will be chosen from among, (a) Baby Health Centre rooms; (b) rest rooms; (c) Childrens playground; and (d) Public library. Riverine Herald (Echuca, Vic. : Moama, NSW), 14 June 1950.